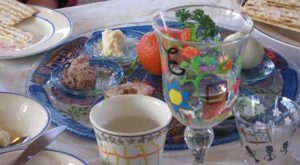 Please join us at our fun, meaningful, and exciting Passover seder, led by Rabbi Robin S. Sparr! Children are welcome, as are friends from the wider community. We ask that each family bring one or two food items (to serve 8 to 10 people total). Reservations are required. E-mail seder@temv.org by March 25, 2018. Please also let us know if you are willing to help with table setting and seder plate preparation!